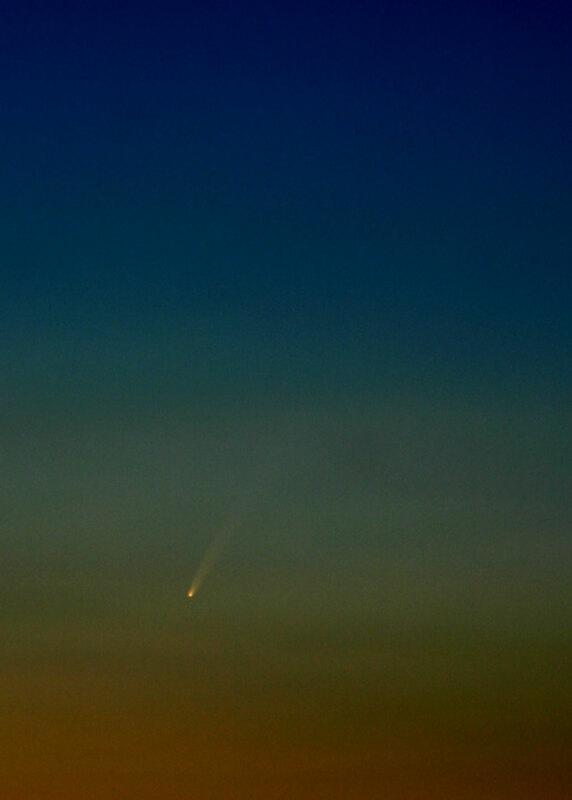 Chris Newsome took this spectacular image of Comet McNaught on the 10th January 2007 using a hand-held Canon EOS 300D camera while leaning out of his back-bedroom window! Chris comments: "After weeks of cloudy skies, the clouds parted this evening to give me a view of Comet McNaught that was absolutely astounding. As soon as the sun had set, with the sky still very orange, the comet and it's incredibly long tail were clearly visible with the naked eye - the magnitude is currently at at about -2, brighter than Sirius and the only object brighter (apart from the moon and sun) is Venus at -4 magnitude. I would estimate the tail length at about twice the visible diameter of the full moon. The image is, in fact, a very accurate representation of what I saw with the naked eye, colours and all!" The image is comprised of 12 exposures at 1/13th second at 200ASA, combined in Maxim DL and processed (very slightly) in CS2. The lens was 140mm at f/5.6. Chris' image also appears on the Sky & Telescope website!